The root zone of the plant determines how big a soil reservoir there is for the plant from which to draw water. Early in the season the crops have shallow root zones that require light frequent irrigations. As the plant grows the roots go deeper into the soil with a corresponding increase in water requirements. Irrigation scheduling can be compared to a bank account. By knowing the soil type, the water holding capacity of the root zone, daily water use, pumping system efficiency and climatic conditions the amount of water applied can furnish the amount of water needed by the crop. Crop water use must be divided by the efficiency of the system. The next week’s water needs can be anticipated from weather forecasts. Above normal temperatures and excess wind can increase the amount of water needed. Keeping the soil profile filled with water without excess irrigation losses, will prevent stress and a loss of yield if short periods of high water use exceed the system delivery capability. Any amount of water over the water holding capacity of the soil cannot be considered as this will be unavailable to the plant, because of the leaching. The amount of rainfall can vary from one side of the field to the other. Rain gauges should be placed at more than one location to obtain an average reading. Future precipitation needs to be considered to prevent over irrigation especially in areas where irrigation is used to supplement rainfall. Weather bureaus forecast rainfall for extended periods in advance. The question often arises as to when irrigation can be stopped without affecting crop yield. The more complex the calculation, the greater the accuracy, but the more difficult and time consuming it is to obtain and process the data. The temperature based equations are reasonably satisfactory under humid conditions, but under arid conditions, crop water use may be underestimated. Water use based on temperature and radiation may also underestimate water needs under dry, windy conditions. 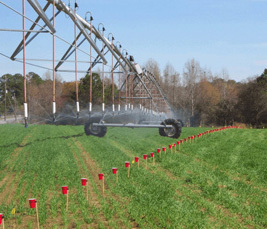 Irrigating according to temperature can be accomplished under farm conditions. A maximum/minimum thermometer should be used. These record the high and low temperatures for a 24-hour period. The average temperature can then be calculated and compared with an average for the area. These instruments are relatively inexpensive and one should be used for each tract of land, especially if fields are not near each other. Placement of the thermometers is important. For example, a low spot in the field can be cooler at night than a hill top because cold air, being heavier, will sink to the lowest areas at night. The general topography of the field must be considered in where the thermometers are located for average conditions. One response to "Irrigation scheduling"
I need help on how to do an irrigation schedule on the winter wheat I am planting. I’ll be soon using center pivot.